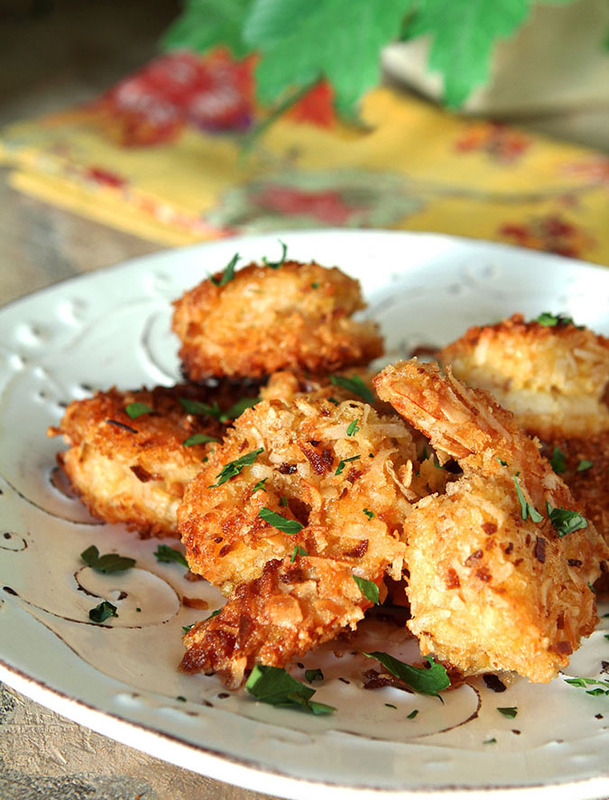 Make this Crispy Coconut Shrimp Appetizer. We’ve added curry for extra oomph but if it’s not your thing, add a bit of your favorite spice. It’s easy and delicious! I had just uncovered a stash of large shrimp the other day and had it in my mind to make something with them. I have one of those refrigerators with the pull out freezer drawer; you just never know what you are going to find in there…am I right? 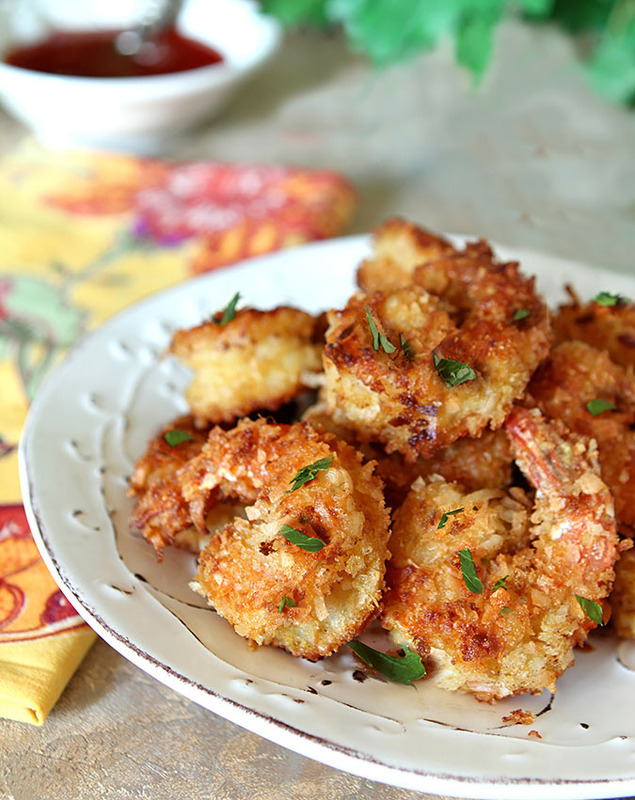 So I was hankering for something shrimpish when I spied a recipe on Facebook for a Crispy Coconut Shrimp Appetizer. Perfect. That recipe was made to be gluten free so I had to do some further research to get back to my pre-requisite…ALL gluten! In doing so I noticed that every recipe was pretty much identical in their ingredients and decided to not mess with success…someone surely knew this dish better than me so I forged ahead. I am so grateful I only cooked half of that stash. Now, I won’t go so far as to say they were bad but they were sure bland. I had sort of thought that only a half teaspoon of salt was pretty light-handed considering it was a pound of shrimp and quite a bit of other ingredients for the coating including the flour, eggs, coconut and panko and I wish I had gone with my first instincts and upped it a bit. But beyond that? It still needed something else. The bland wasn’t just from lack of salt so I tried a second time and came up with a winner. I don’t often go through multiple trials with recipes I’m working on but this time I’m grateful I did…the effort was minimal but the end result was vastly improved. Beyond doubling the salt, I decided that I wanted to ditch the notion of unsweetened coconut and use a sweetened version while also adding both curry and garlic powder to the mix. The big difference? The first batch needed the Chili Sauce to be good and the 2nd did not…the coconut flavor was more pronounced and the addition of just a bit of spice really pumped up the volume. I can’t say it tasted like curry or garlic but it sure tasted good! I started with a smallish amount…you might try adding a bit more of the curry if you really like that flavor, I probably will too the next time I make it! Don’t let the frying business scare you off either; a bit of oil in a skillet and it was quick and easy. I do like to add a bit of butter or ghee to my oil when I fry something to add just a touch of flavor. Try it, you might like it too! This was meant to be an appetizer but quite frankly…with some rice and a simple salad it became dinner. I do love small bites for dinner but it’s usually at a restaurant and we order multiple appetizers. This time it was just one really good appetizer that made three servings and we called it dinner! Line a large rimmed baking sheet with parchment paper and place the grated coconut on it in single layer. Place the baking sheet in the center of the oven for five minutes, remove from the oven and stir them around and bake for up to five more minutes until they are a very light golden color and completely dry (watch carefully). Remove from oven and let cool. Mix the cooled coconut with the panko in a shallow bowl. Mix the flour, curry powder, garlic powder, salt and pepper in another shallow bowl. Beat the eggs and water together in a third bowl. Add about 1/2 inch of oil, along with the butter if using, to a large heavy bottomed pan such as a cast iron skillet and heat until rippling. Set up a dipping station with the three bowls in this order; first the flour, then the eggs and last the panko and coconut mixture. Hold the shrimp by the tail and dip it in the order of the bowls; first flour, shaking off excess, then eggs, then the coconut/panko combination (yes I make sure to pile it on!). Fry the shrimp in small batches, about 2-3 minutes per side, being careful to not crowd the pan. Cover a plate with paper towels; remove the shrimp from the pan with tongs and let drain on the paper towels. Let cool for a minute and then serve warm. 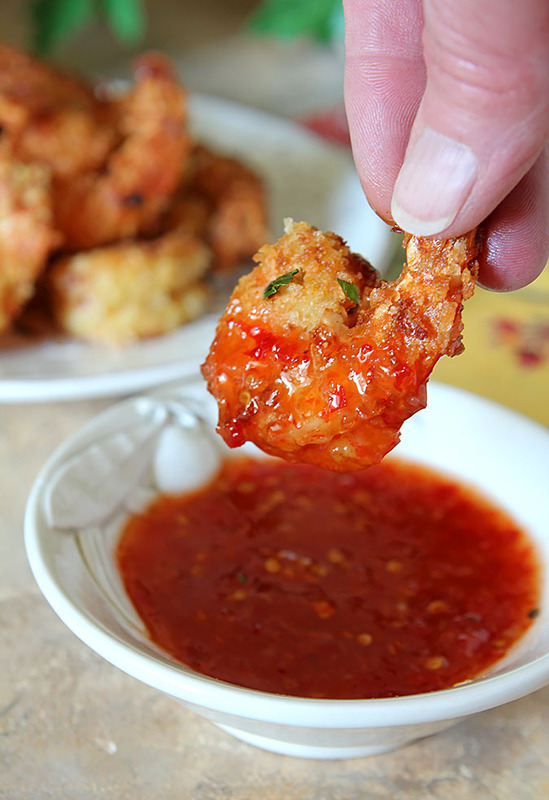 Use large shrimp for this recipe! I have an amazing coconut shrimp recipe that was passed down through the ages, it’s not quite like yours and includes a few more ingredients that I can never find in Colorado, however, I’ll be giving your recipe a try since we just love coconut shrimp at our house. I often find some acid (lemon juice, vinegar) helps bland things. Brings out the flavor, somehow. Anyway, these are gorgeous! Bet they taste wonderful. 🙂 Thanks!